Left over rice was exactly what I needed along with the sweet and sour prawns to whip together a quick fried rice that had the flavors melding together to create a wonderfully savory rice dish. Anyone out there looking for a satisfying meal with a lot of flavor and ease in preparation has to try this one. 1 Marinate the cleaned and de-veined prawns in tomato sauce, vinegar, soya sauce, brown sugar and red chilli paste for 15-20 mts. 2 Heat oil in a wok or kadai, swirl it all over and it should be smoking hot. Add the minced garlic and ginger and saute for a few seconds. Add the chopped spring onion whites and green chillis stir for 2 mts, constantly tossing them. 3 Add the marinated prawns along with any left over marination and cook on high heat for a mt without tossing. Flip the other side and cook for another mt. Combine once again and cook on medium heat for 3 mts or till done, tossing constantly. Season with salt. 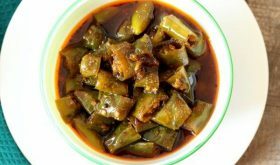 4 Garnish with spring onions greens and serve hot as an appetizer or stir fry. 1 Heat sesame oil in a large wok and once the oil is piping hot, add the spring onions and stir fry for 1 mt on high. 2 Add the rest of the vegetables and toss them on high heat for 3-4 mts. 3 Add salt and pepper pwd combine. Add the cooked prawns and toss. Cook on high for a mt. Add the cooked cold rice and combine well. Spread it all over the pan and leave on medium high for a mt. Combine again, spread out and leave on medium high for another mt. 4 Add vinegar and toss all the contents on high heat for a few seconds. Turn off flame. Garnish with chopped spring onion greens and serve hot. All your recipies are pretty easy to make. I have tried many of your recipes and they are amazingly delicious. Please do post more Andhra recipies. My kids & me love prawns. This looks very very tempting! Nice post sweeti..for us vegans what can we substitute prawns with…..!! can you write some nice kofta recipe..which i think is a good substitute.. anything else.. do enlighten me. This is Jyotsna and we stay in Pennsylvania. i am new to your blog, i tried some your recipies and they turned out pretty well. thank you very much for your recipes. Thats looking fantabulous… lovely clicks and nice post. I have never stored prawns. But if you want to cook the next day, clean, de-vein and wash. Add salt and turmeric pwd and give a good rinse in water and drain completely. Stir fry in a pan drizzled with oil for 3-4 mts or till they turn pink, add turmeric pwd and combine well and freeze. Try it and leave your feedback. if i want to buy shrimp, do we need to buy cooked or uncooked? which gives better taste? can u tell me which brand in walmart, wegmans. bye. Sowmya, I have used uncooked prawns available in our local market here at Vizag. I am not aware of which brands are good at stores in US. Delicious recipe. Can you post any prawn snack items in the future? Please. Truly delicious and a treat! With m in mumbai, this is perfect for a bachelor! 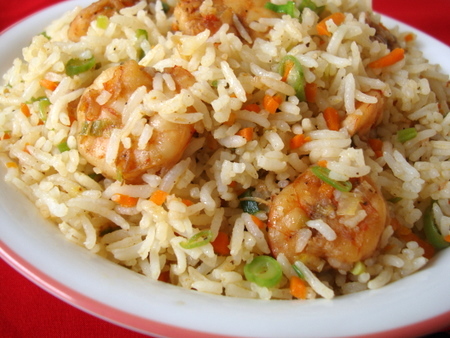 hi sailu garu, very good, ur recipes r excellent especially this prawn fried rice is looking so yummy. keep posting. can u pls post some crab recipes? my hubby likes it very much but i cant make, feel little bit scary. do pls help me. I love prawns and sweet ‘n sour chinese dishes. 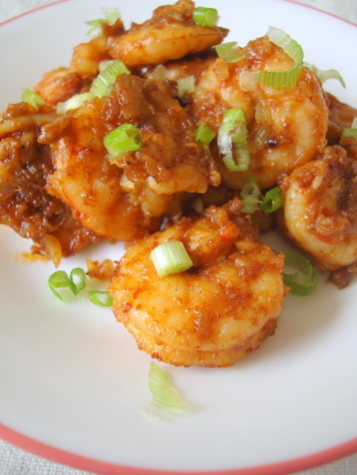 Thank you, for posting this interesting prawn recipe..This recipe pulls me into the kitchen, imagining it’s delicious aroma.. I tried the Sweet and Sour Prawns Recipe last night and it come out very good. I love your site as the recipes are very easy to follow and tasty too. Keep blogging new recipes to water our mouths.. 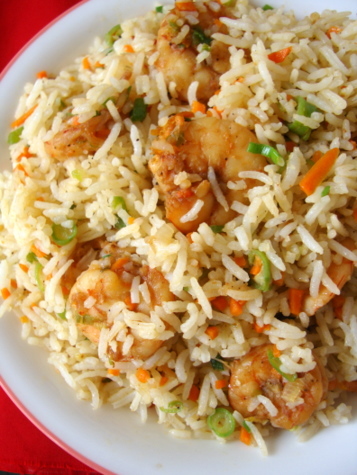 I luv ur recipes ……..
wht’s ur area in vizag???? It came out so well. I added eggs in the place of vegetables. My husband loved it. Thank you so much. Soak 2 to 3 red chilies in little hot water for few mts. Grind to a fine paste. You can remove the seeds at the time of soaking if you do not want a very spicy paste.